Diamond Hard paint from Majic Paints is an oil-based paint with all the benefits of an acrylic paint! Diamond Hard paint is an amazing paint offered by Majic Paints. This paint has all the benefits of an oil-based paint while achieving the look of an acrylic paint. This paint can stick to almost any interior or exterior surface without a primer, and it’s brilliant, glossy color has incredible retention. Whether you’re painting a wall, furniture, or craft object, you won’t be disappointed with Diamond Hard. 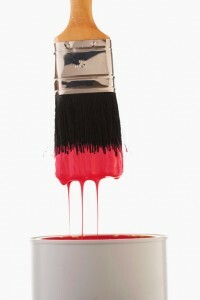 Acrylic paints and oil-based paints both have their own advantages and disadvantages. Among the advantages of acrylic paints are that they will stick to nearly any surface, whereas oil-based paints need to have the surface prepared first. Acrylic paints also have brilliant color retention. However, oil paints have the advantage of taking longer to dry, so you don’t have to worry about putting down your brush to take a phone call and coming back to a crusty dried exterior of paint on the brush. Diamond Hard manages to capture the best of both worlds. Not only is it slow drying, it also has the acrylic qualities of sticking to almost any surface without needing a primer and having beautiful color retention. Diamond Hard paint from Majic Paints is so effective, we can see it at work at the Louisville Slugger Museum in Louisville, Kentucky. The Louisville Slugger Museum is known for the gigantic baseball bat that leans against the building. To really make this baseball bat shine, Majic Paints and the Louisville Slugger Museum collaborated on the ultimate craft project. The baseball bat was first stripped entirely in preparation for painting. Two coats of Diamond Hard red primer were applied to the gigantic bat, followed by two coats of Diamond Hard yellow paint. Finally, Diamond Hard brown paint was used to expertly add a natural-looking wood grain, and Diamond Hard dark brown was used to add the finishing details.